The Lilac City Classic is ready for it's premier debut! 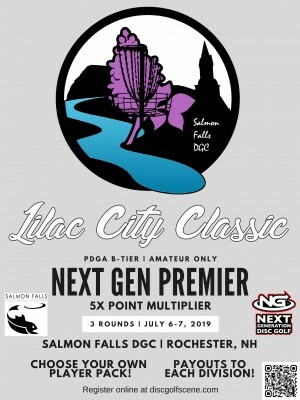 Salmon Falls DGC is sure to impress those who aren't familiar with it's beauty and design the same way it has impressed the thousands who have played it before! This tournament will have 3 PDGA rated rounds. Day one will consist of a Tee Time round (appropriate layouts will be utilized by division). Day two will consist of two shotgun start rounds on the white layout. The top four finishers in MA1 and FA1 will play a final nine holes to determine a winner. NG limited run Disc, Sticker, Towel, Hat, and Backpack or something of similar value. Brand choice includes: Discraft, Innova, Latitude 64, Legacy, Prodigy, MVP, Gateway, Discmania, and Kastaplast. Matthew Grayum is responsible for all refunds/cancelations per PDGA guidelines. 8:00am Players can begin checking in for their tee times. Please check-in at least 15 minutes before assigned tee time. - 6:00pm Final nine holes for top four finishers in MA1, and FA1.